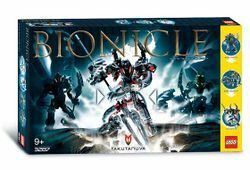 3287 Takutanuva is a BIONICLE combiner set released in 2003. It usually has the 396 pieces from both sets; 8593 Makuta and 8596 Takanuva to assemble Takutanuva. Building instructions for both sets and the combination model are included. The set is the same as 10201 Takutanuva, the only difference being that 10201 includes the "movie edition" Kraahkan. This is a description taken from LEGO.com. Please do not modify it. (see an archive of the product's page) The power of light and shadow! This page was last edited on 9 February 2019, at 17:28.